Karen Ekelund has an uncanny bond with here 2 Saddleback Gunnels. I’ve been a member of the Coldwater Marine Aquarium Owners group on Facebook for a few months, and every so often something pops up that really grabs my attention. 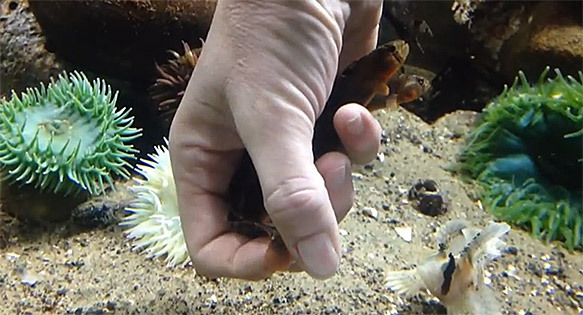 Recently, it was a short cell phone video of Karen Ekelund’s two Saddleback Gunnels, Pholis ornata, seeking refuge within the gentle hands of their aquarist. The “awe” factor aside, these are more than just “cute” fish. According to Fishbase, this species reportedly ranges from southern British Columbia to the central California coastline. IUCN data further suggested that this species generally prefers estuarine habitats. It can therefore tolerate a wide range of salinities, and can be found over rocky and pebble substrates, or even mud flats, feeding on molluscs and crustaceans. The guys over at Coldwater Marine Aquatics put the size on this species as ranging anywhere from 4 to 9 inches. Of course, the marine fish breeder in me read “both the male and females guard the egg mass” and it got me hoping that Karen’s two gregarious Saddleback Gunnels might even be a male/female pair. Given how comfortable these two fish are with captivity, I can only imagine how charming their captive-bred offspring could turn out to be. I’m also pretty sure that no one out there has bothered to breed Saddleback Gunnels in captivity…Marine Breeding Initiative‘s Species First Award Karen – are you up for the challenge? Ekelund was kind enough to put together a several minute “movement of zen” for us to share, so please give a big “thumbs up” to her video; it’s the most adorable fishkeeper/fish interaction I’ve seen in a long time. If you’re enjoying what you’re watching, check out the May/June 2014 issue of CORAL; it’s about time we took an in depth look at the cooler side of marine aquarium keeping! Feeding time in Karen Ekelund’s Coldwater Reef (and now you’ll know how she created such a magical bond with her fish)! The video prominently features Ekelund’s Sailfin Sculpin, Nautichthys oculofasciatus, a fish species already destined to be a perennial coldwater reef tank favorite. @ 0:57 what is the white and black fish underneath?